Master Tung Hu Ling, born in 1917, was a native of Ren County in Hebei province. From a very young age, he was known to possess high intelligence and an inquisitive mind. He was particularly fond of martial arts, and he studied under many distinguished teachers. 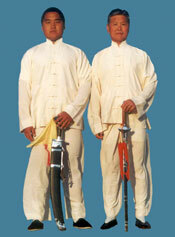 A strong foundation of Taichi skill was laid by his father, Grandmaster Tung Ying Kit. He also had the benefit of being personally tutored by his father�s teacher, Taichi Grandmaster Yang Chenfu. Responding to his father�s call for the promulgation of Taichi, he came to Hong Kong in 1947 to help in the running of the �Tung Ying Kit Taichichuan Gymnasium�. In 1954, leaders of the Chinese community in Thailand invited Grandmaster Tung Ying Kit to tour the country and teach their members taichichuan. Master Tung Hu Ling undertook the first teaching tour there, which was met with great enthusiasm. He established the Thailand chapter of the �Tung Ying Kit Taichichuan� and subsequently the number of students expanded rapidly. The following year, Grandmaster Tung Ying Kit toured South East Asia, where he was met with special welcoming activities organized by the students. These included a motorcade through the city centre. In the meantime, Master Tung Hu Ling had been extending his teaching activities to include Singapore and Malaysia. This explains how many of the Yang School Taichichuan practitioners in Hong Kong, Macau, Singapore, Malaysia, and Thailand could trace their lineage back to the first students of the two Grandmasters in these places. In February of 1957, Master Tung Hu Ling produced his famous book �Applications Of Taichichuan�. There were pictures of him practicing with his brother Junling (the third son of Grandmaster Tung Ying Kit) in the demonstration of the various forms and applications of the Taichi martial art. The book was enthusiastically and widely received by people practicing Taichichuan. When Grandmaster Tung Ying Kit passed away in 1961, Master Tung Hu Ling inherited his father�s mission. Together with his sister Jasmine and his son Kai Ying, they continued to promote and extend taichichuan in Hong Kong, Macau and South East Asia. Master Tung Hu Ling was invited to visit North America in 1965. His traveling took him to San Francisco, Los Angeles, New York, Toronto and Hawaii. Many people became his students during this period. 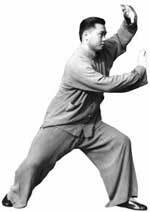 Since then, Master Tung Hu Ling had established a firm foundation of Yang style Taichi overseas. In 1966, the Master emigrated to Hawaii and established his gymnasium. His son Kai Ying moved to Hawaii the following year, and later they expanded their teaching activities in Los Angeles. Master Tung Hu Ling passed away in 1992. Throughout his life, he had been a keen and disciplined student and teacher of taichichuan. His modesty and readiness to accept and study different views and perspectives, as well as his profound understanding of taichichuan, enabled him to take his art to the very peak. This was well known to people far and wide. As a person, he was polite and amiable, and was above political and worldly considerations. As a teacher, he was patient and considerate, and approached his students with carefully thought-out methods. He was a role model for all of the participants of Taichichuan.